Details about EAST AFRICAN CURRENCY BOARD P 43b "ELIZABETH" 20 SHILLINGS 1962-63ND RAW AU! EAST AFRICAN CURRENCY BOARD P 43b "ELIZABETH" 20 SHILLINGS 1962-63ND RAW AU! 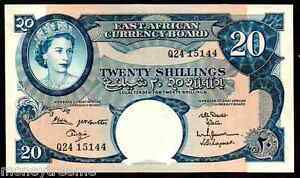 EAST AFRICAN CURRENCY BOARD P43b "QUEEN ELIZABETH II" 1962-63ND 20 SHILLINGS "NAIROBI" ALMOST UNCIRCULATED! THIS INCREDIBLY POPULAR PIECES LOOKS GEM ALL THE WAY AROUND! AS YOU WILL RECEIVE THIS EXACT NOTE!